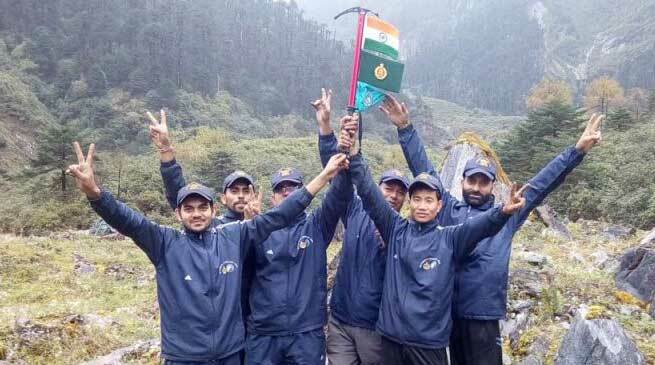 A joint expedition team of ITBP and Indian Mountaineering Foundation, New Delhi have successfully scaled the base of Mt Kangto, which is a part of Eastern Himalaya situated along the Indo-China Border. The team started their expedition from BOP (54 BN ITBP), Bameng and reached the base of Mt Kangto via Upper Liyak-Lada-Besai villages. Mt Kangto with an altitude of 7042 meters is the highest peak of Arunachal Pradesh. It is covered by the snow throughout the year. It is a source of Pachuk River, which is one of the main tributaries of Kameng River of East Kameng District in Arunachal Pradesh. The distance from Besai village to the base of Mt Kangto is more than 50 km. Exploring the treacherous terrain of the peak in this part of the country is itself a great feat for anyone. All earlier attempts by any party or group were unsuccessful. No individual or group has succeeded in reaching the base of Mt Kangto. The expedition could be considered as one of the great achievements of ITBP. On reaching the base, the team has unfurled the National Flag. En route the base, the team has organized series of medical camps at various villages. They diagnosed and distributed free medicines to the villagers. As reported by the team, the villagers were very cooperative and accommodative. They further acknowledged and expressed gratitude to the district administration led by i/c Deputy Commissioner Tamuna Messar for the logistics supports provided in terms of ration and porters. “Now the route from Besai to the base of Mount Kangto is explored and opened, it would provide immense opportunity in the development of eco and adventure-tourism in this area,” the team leader added. The expedition team comprising of more than 50 personnel and porters was led by Dy. Commandant (ITBP) Hari Singh along with Asstt. Commandants (ITBP) Shiv Prasad Sati and Dinesh Negi, and commanded by M.S. Rawat, IG (ITBP), North East Frontier, Itanagar. Earlier, the ITBP-IMF Mt Kangto Joint Expedition-2016 was flag-off by the Hon’ble CM Pema Khandu on 25th September, 2016 at Itanagar.